Provisionals have to fulfill important functions within the timeframe between preparation of a tooth and until fitting the final fixed metal or ceramic restoration. A well-made provisional fixed partial denture should provide a preview of the future prosthesis and enhance the health of the abutments and periodontium. 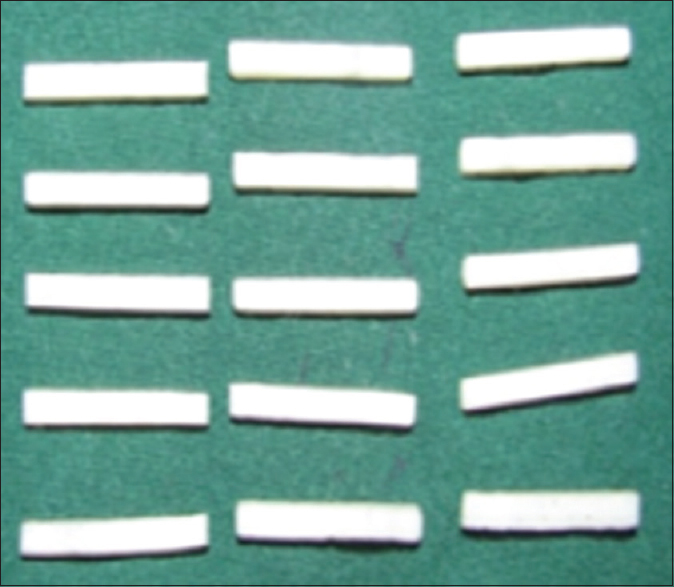 To reduce tissue toxicity and thermal irritation of the conventional resin systems, new interim restorative materials that contain no methyl methacrylate have been introduced such as visible light cure resin, bis-acrylic composite resins, and visible light and chemical cure (dual cure) resins. Controlled prospective clinical trials on temporary crowns and fixed partial dentures do not exist in the dental literature. These provisional-fixed prostheses must fulfill biologic, mechanical, and esthetic requirements to be considered successful. Resistance to functional loads and removal forces is “mechanical factors” that must be considered when choosing a provisional restorative material for clinical use. 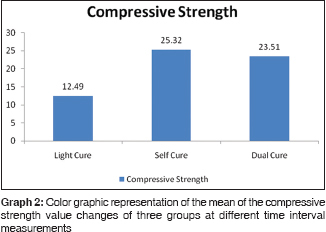 The aim of this study is to choose a material to serve as a better interim prosthesis and to compare three different properties – flexural strength, compressive strength, and color stability. 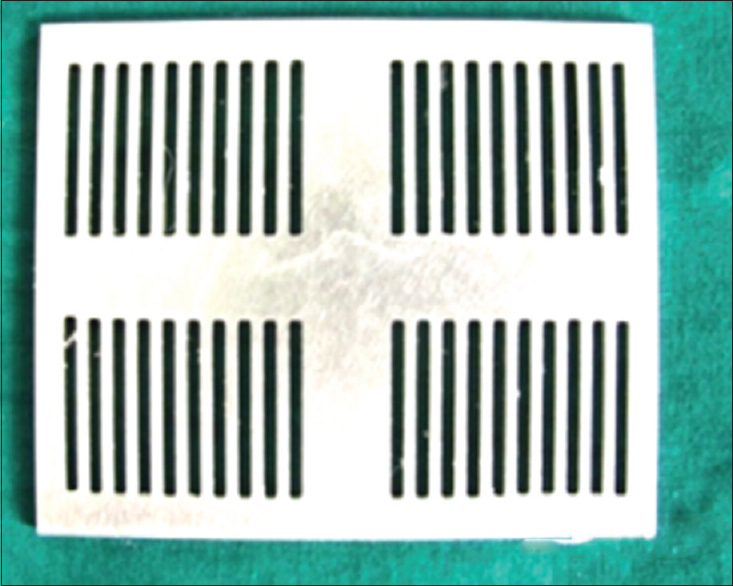 The samples were made with three different provisional materials (Revotek LC, Protemp 4, TemSpan) as mentioned above to compare the mechanical properties such as flexural strength, compressive strength, and color stability. TemSpan (Pentron Clinical Technologies, LLC): Dual-cure resin system. Group 3 - Thirty samples made, ten samples each for three properties. 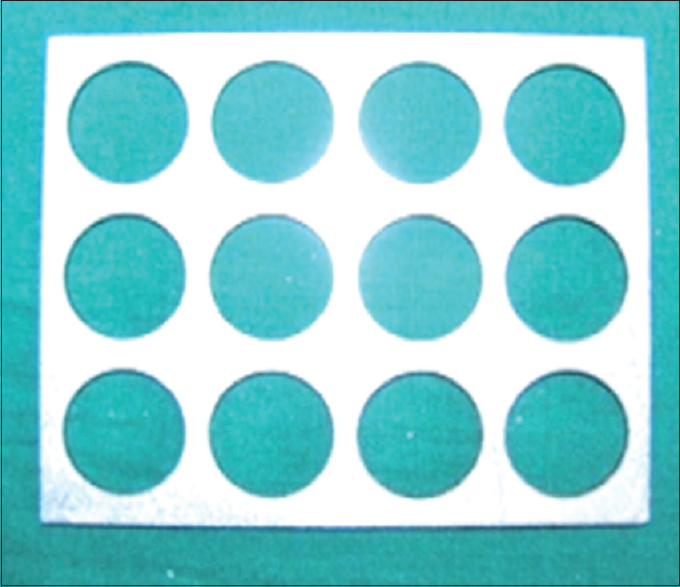 The specimens were fabricated for each material with use of stainless steel molds [Figure 1] and [Figure 2]. The materials were mixed according to the manufacturers recommendations and loaded into the mold. Another glass slab with a plastic matrix was later placed on top of the molds and wiched between two glass slabs. Specimen A: According to the ADA specification number 27, size 25 mm × 2 mm × 2 mm samples for comparing flexural and compressive strength values using universal testing machine Instron [Figure 3]. 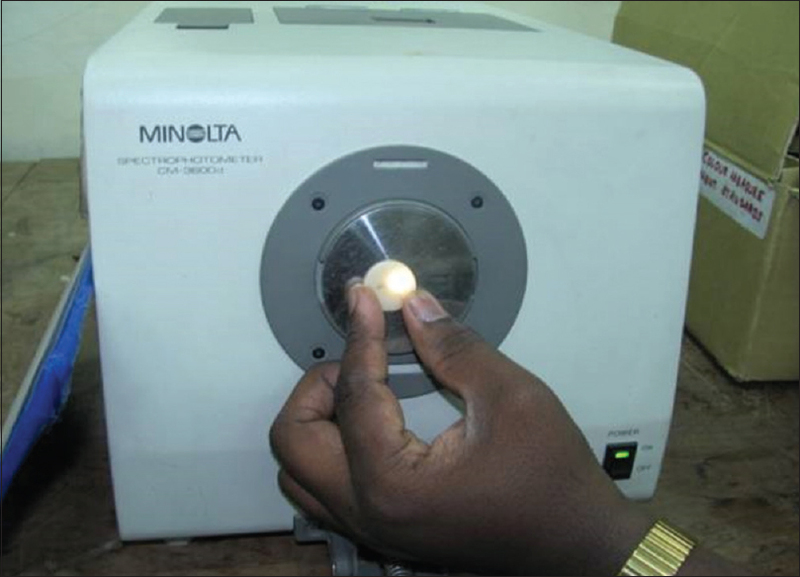 Specimen B: Size 20 mm diameter circle, 2 mm thick samples for comparing color stability values using spectrophotometer [Figure 4]. After fabrication and finishing, the specimens were soaked in artificial saliva at 37° for 10 days. Later, all specimens were placed on top of the platform of the universal testing machine to undergo a three-point bend test. A load of 10 kN load cell at a crosshead speed of 0.75 mm/min was applied. The force at fracture was recorded in Newton and calculated in MPa with the use of testing machine software [Figure 5]. The specimens were fabricated as similar as mentioned above and then placed on top of the platform of the universal testing machine. A load of 10 kN load cell at a crosshead speed of 0.75 mm/min was applied. 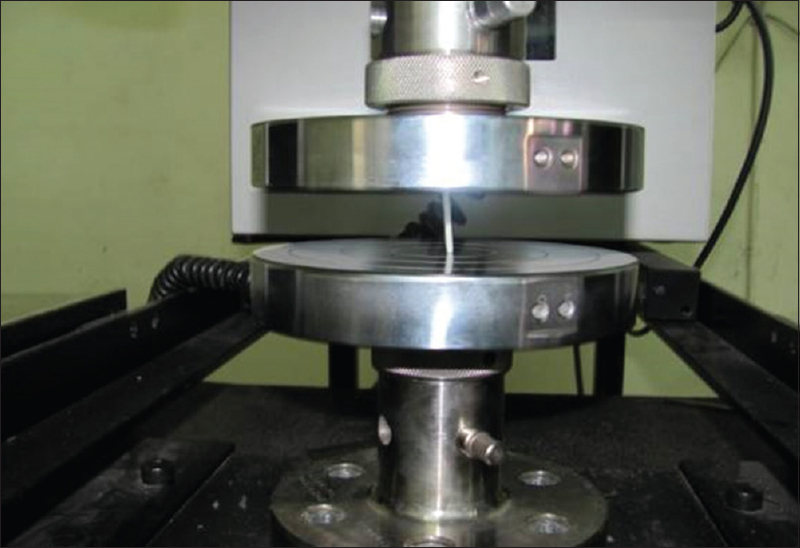 The force the sample could withstand till the start of deformation was recorded in Newton and calculated in MPa with the use of testing machine software [Figure 6]. where ΔL*, Δa*, Δb* are the differences in L*, a*, and b* values before (T0) and after immersion at each time interval (T7, T10). Student's paired t -test was used to calculate the P value. 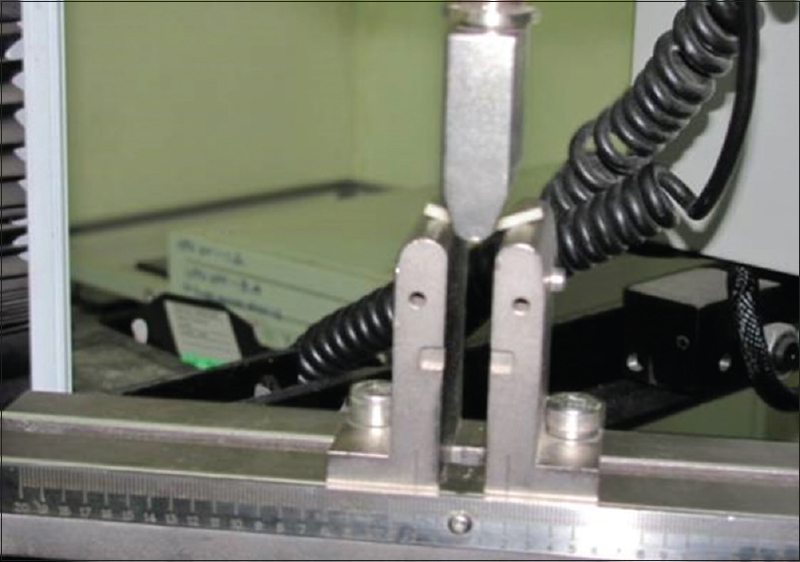 Ten samples each from Groups 1 and 2 of specimen A underwent a three-point bending test using a universal testing machine Instron for measurement of flexural and compressive strength. The results obtained were tabulated and graphs were made [Table 1], [Table 2], [Table 3] and [Graph 1] and [Graph 2]. Ten samples each from Groups 1 and 2 of specimen B underwent color analysis testing using spectrophotometer at different immersion periods. The results obtained were tabulated and graphs were made [Table 1], [Table 2], [Table 3] and Graph 3]. Group 1 showed least color changes, and hence, it is more color stable compared to Group 2. 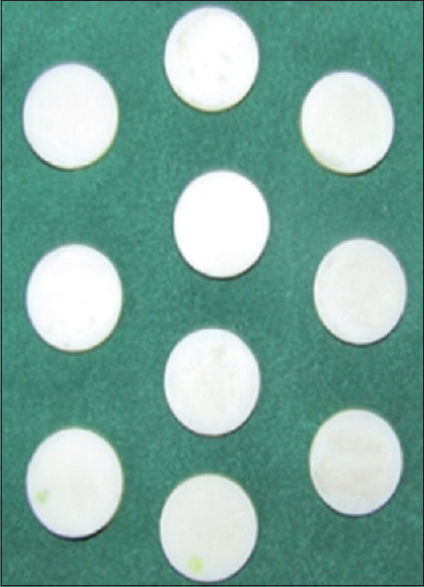 An ideal provisional must fulfill biological, mechanical, morphological, psychological, and esthetic requirements, with the introduction of composite-based materials, which may be chemical, light, or dual cured acrylic resins have lost their popularity., Diaz-Arnold in their study demonstrated that bis-acrylic-type composite resin exhibited higher microhardness and greater surface integrity than the methacrylate resin materials. Polymerization shrinkage plays a major role in the fit of provisional restoration. Volumetric shrinkage was 6% for polymethyl methacrylate and 1.0–1.7% for composites. Hence, composites allow better marginal fit than polymethyl methacrylate because of less contraction due to polymerization. 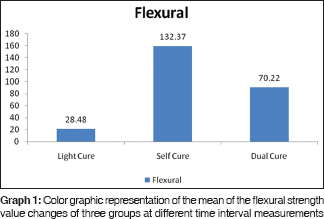 Group 1 - Light cure material – Revotek LC is more color stable. If a provisional long span bridge has to be placed, then chemically cured Bis-GMA-based material (Protemp 4) can be used. It was inferred from the study that no one material was superior in all three tested parameters. Although these products are made from similar materials, variation in formulation, including the cross-linking agents, appears to have resulted in variations in the performance. Further investigation is required to elucidate the nature of product differences and the way in which these materials respond to the oral environment. Federick DR. The provisional fixed partial denture. J Prosthet Dent 1975;34:520-6. Tjan AH, Grant BE, Godfrey MF 3rd. Temperature rise in the pulp chamber during fabrication of provisional crowns. J Prosthet Dent 1989;62:622-6. Ha SR, Yang JH. Comparison of polymer-based temporary crown and fixed partial denture materials by diametral tensile strength. J AdvProsthodont 2010;214-7. Caputi S, Traini TA. Provisional gold-resin restoration executed through an indirect-direct procedure: A clinical report. J Prosthet Dent 2000;84:125-8. Aloul RK, Hansen ACA. Procedure for provisional prosthesis characterization. J Prosthet Dent 2001;86:665. 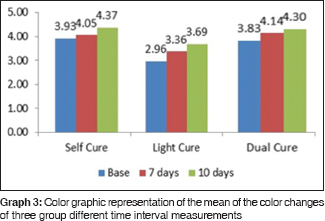 Senay Canny, Murat: The effect of current bleaching agents on the color of light-polymerized composites in vitro . J Prosthet Dent 2003;89:475-78. Okubo SR, Kanawati A. Evaluation of visual and instrument shade matching. J Prosthet Dent 1998;80:642-48. Yannikakis SA, Zissis AJ, Polyzois GL, Caroni C. Color stability of provisional resin restorative materials. J Prosthet Dent 1998;80:533-9. Young HM, Smith CT, Morton D. Comparative in vitro evaluation of two provisional restorative materials. J Prosthet Dent 2001;85:129-32. Diaz-Arnold AM, Dunne JT, Jones AH. Microhardness of provisional fixed prosthodontic materials. J Prosthet Dent 1999;82:525-8.